Riding off the back of their groundbreaking debut gig earlier in the year, revolutionary rap-rock supergroup Prophets of Rage have decided to hit the road on a mammoth tour dubbed the Make America Rage Again tour! The sensational band comes to Veterans United Home Loans Amphitheater on Thursday 29th September 2016 for a night of rocking music, so prepare to watch them turning up the amps and taking down the establishment! American supergroup Prophets of Rage formed in 2016. 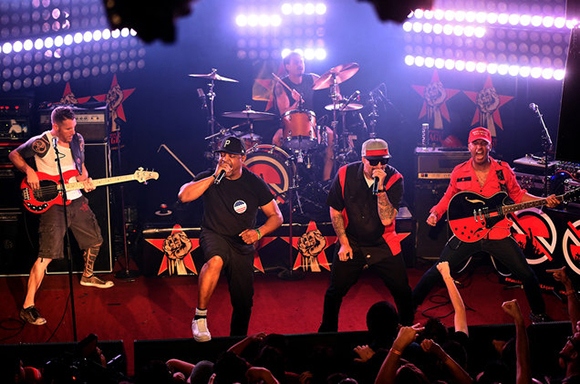 Consisting of members of Rage Against the Machine (bassist and backing vocalist Tim Commerford, guitarist Tom Morello, and drummer Brad Wilk), alongside Public Enemy's Chuck D and Cypress Hill's B Real, their name was taken from the title of the Public Enemy song "Prophets of Rage" from the 1988 album It Takes a Nation of Millions to Hold Us Back. Rage Against the Machine, Cyprus Hill and Public Enemy are all hugely successful, politically driven bands who rose to prominence in the late 1980s/early 1990s and have sold millions of records worldwide. In an interview with Rolling Stone, guitarist Tom Morello said:"We're an elite task force of revolutionary musicians determined to confront this mountain of election year bulls***, and confront it head-on with Marshall stacks blazing."